All native birds are protected under the Wildlife Act 1975 and there are serious penalties for taking, harassing or injuring native wildlife. It is illegal to kill birds, or to interfere with their nests containing eggs or young without a permit or authority. Visit the Wildlife Rescue South Coast 'Swoop' page for tips to protect yourself against swooping birds but if you have a particularly aggressive bird that you are concerned about, contact your local council. Australian Magpies known as ‘Policemen of the bush’ are widespread and common, especially in suburbs and farmland. They are impressive birds with their distinctive black and white plumage and melodic warbling. Magpies are highly territorial, and have strict social order, often living in territorial groups. Magpies will not breed while part of the larger group. Breeding couples have their own territory which they rigorously defend from all threats. From August to October, breeding magpies build nests of sticks lined with anything from grass to bits of plastic and wire. They are usually built high in the gum trees. The eggs hatch after about 20 days, and the young spend 4 weeks in the nest before they fledge. Magpies are very protective of their young and may swoop on intruders if they feel threatened. Australian Magpies belong to the same family as Butcherbirds and Currawongs. Magpies spend a lot of time on the ground searching for seeds, insects, worms, spiders, lizards, mice and beetles. While the scourge of school-children and posties, the magpie is in fact a highly intelligent bird, and a favourite with many wildlife carers because of their intelligence. To learn more about Magpies, their history and behaviour including why they swoop, Wildlife Rescue South Coast recommends the books "Magpie Alert" by Darryl Jones (UNSW Press) and “Australian Magpie: Biology and Behaviour of an Unusual Songbird” by Professor Gisela Kaplan (reprinted 2010). Magpie-larks look similar to Australian Magpies, however they are smaller and have more white on their feathers, especially on the belly. They are commonly found in urban parks and gardens. Magpie-larks breed from January to December and build a solid bowl for a nest made from mud and plant material. 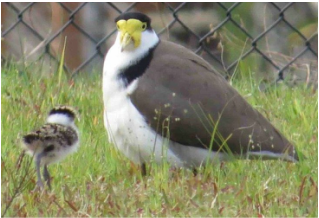 Masked Lapwings live in wetlands and grassy woodlands, as well as paddocks and playing fields. They are also bold enough to claim suburban parks and gardens as their territory. Noisy early in nesting season, strongly defends its nest sites, dives at intruders and at times strikes with its wing spurs. They nest on the ground or on a flat roof, and swoop to protect eggs or their young from July to November. It is wise to give Plovers their space and stay well away from their young as the parents can be very aggressive. Despite their moderate size, Noisy Miners aggressively attack larger birds such as hawks and kookaburras. These attacks may be so vigorous that most other birds are excluded from an area occupied by Noisy Miners. They are found in woodlands and open forests. Noisy Miners have also become well adapted to suburban situations and are a common sight in parks and gardens. Noisy Miners can be annoying because of their constant vocalizations, but their main problem is the impact they have on other birds. Both problems arise from a dramatic increase in their abundance resulting from the creation of favourable habitat by humans. The female constructs the nest and incubates the eggs alone, but both sexes will care for and feed the young birds. Additional 'helpers' also feed the young. Interestingly, these helpers are almost always male birds. Grey Butcher birds resemble a grey and white, half-sized magpie. Their flight-feathers are black with a white stripe and they have a white patch between the beak and eyes. Grey Butcher birds have a beautiful, melodic warble and a discordant chortling call. They build a strong cup-like nest made of fine twigs, grass and other plant material and breed from July to January. They live in a wide range of woodlands and open forests and are quite common in some urban parks and gardens. Grey Butcher birds, like Australian Magpies, may swoop if they feel threatened. The breeding season extends from July to December and usually only one brood is raised. The nest is a bulky shallow cup of twigs, grass and bark fragments lined with soft material, placed in a tree several metres from the ground. They are very common in urban areas and may swoop and snap their beak if a person passes close to their nests. They are unlikely to make contact and cause injury.